Introduction Peter Singer wrote his provocative essay “Famine, Affluence and Morality” in response to the Bangladeshi famine of the 1970’s. 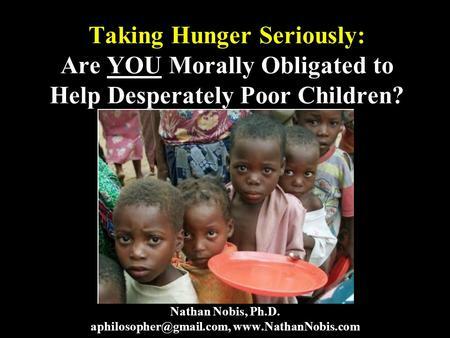 "Famine, Affluence, and Morality" is an essay written by Peter Singer in 1971 and published in Philosophy and Public Affairs in 1972. It argues that affluent persons are morally obligated to donate far more resources to humanitarian causes than is considered normal in Western cultures. In the Peter Singer’s article “Famine, Affluence, and Morality”, he discusses the way that people should take moral in their help toward the support of the Bengal famine crisis. 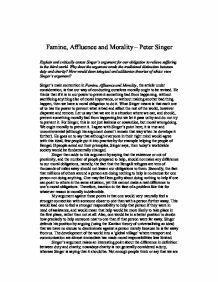 Peter Singer “Famine, Affluence, and Morality” Warm-Up: Think about last week’s activity. Identify which reasons might impact whether or not one ought to donate versus reasons that just explain (psychologically, for example) why one might end up donating or not.